Today in our blog we are going to discuss about the film First Man which is a biographical drama directed by Damien Chazelle in 2018. 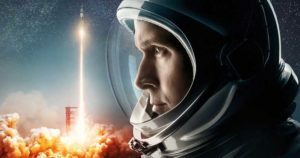 In the Movie First Man actor Ryan Gosling played the role of Neil Armstrong and the film’s plot follows the personal and professional life of Neil Armstrong. Actress Claire Foy played the role of Janet Shearon Armstrong, Neil’s first wife. Born on 1930 Neil Armstrong was an American astronaut, naval aviator, test pilot and university professor. In this film Ryan Gosling was groomed in short-sleeved shirts with short hair cut to get the look of that period. 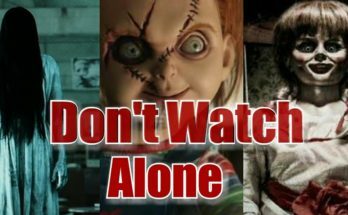 Double Negative Studio worked on Special Effects for this movie. Paul Lambert served as VFX supervisor and Michelle Eisenreich as VFX Producer at DNEG. This film received critical praise for direction, performance, musical score and Moon landing sequence. 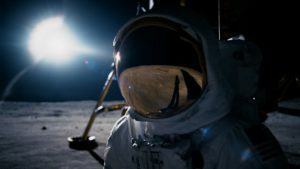 First Man’s running time is 141 minute and the filmmaker used documentary style of shooing to give authentic look. Director Damien Chazelle and Cinematographer Linus Sandgren shot the film in three different formats 16mm, 35mm and IMAX 70mm film. The opening scene featured Neil Armstrong’s X-15 rocket plane bounces off the atmosphere and landed up in Mojave Desert. After the death of his two and half year old daughter Karen, Neil applies for the project Gemini. In 1967 Armstrong was selected to command Apollo 11 for lunar landing. In the year 1969 Apollo 11 successfully launched at the Moon. After landing on the Moon, Armstrong drops Karen’s bracelet into Little West Crater. 16 mm format was used to get the inside scene of the spacecraft. 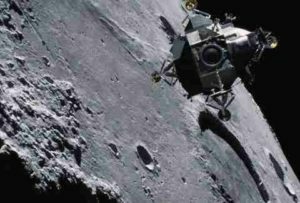 35mm was used for the scenes that occurred in the Armstrong house and around the NASA facility and 70mm was used for moon sequence. VFX techniques like LED Screens, practical sets, models and restored archive footage were utilised in this film. This film used modern VFX, updated old school techniques and extensive miniatures. Oscar winner VFX Supervisor Paul Lambert prepared a huge 35 foot-tall, 65 foot-wide LED screen for projecting 90 minutes digital image created for the film. There was actual footage on the LED screen rather than green screen for the help of actor Ryan. Along with front and side views of the LED screen 360 degree images were also used. LED screen provided visor reflections and reflections on dials inside spacecraft. As NASA had huge stock of film reference of its launches and space journeys, filmmaker took the advantage of such film stock. 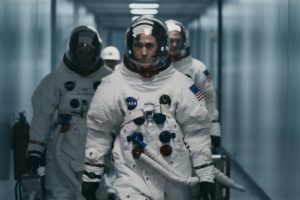 The director and his team collected every piece of archival NASA footage for the visual references of Gemini and Apollo missions that was depicted in the film. The team discovered about 200 cans of 70mm footage at the Marshall Space Centre in Alabama. Lambert and his team digitally processed, cleaned and extended the NASA footage shot on each side of the frame; such as Saturn rocket leaving the launch pad, engines igniting etc. 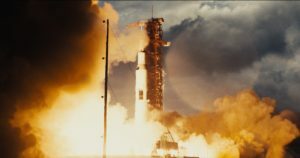 Visual effects team at DNEG cleaned up the original 70 mm footage from the Apollo 14 launch which was added in the film to give cinematic enhancement. Moon’s surface was recreated by building a set on the Vulcan Rock Quarry in Atlanta. Vulcan Rock Quarry has a gray palette that matched the moon surface very well. Single light source was used to show that the light is coming from the sun. 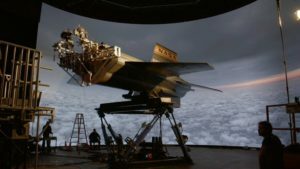 The cinematographer Linus Sandgren used specially built 15-foot-long, 200,000 watt lamp above 500 feet of the set to create the effect of sunlight hitting the moon’s surface and to create harsh shadow. Christian Gelzer( NASA Historian) and astronauts Al Bean and Al Worden were on the set as technical consultants. The team tried to match the space scenes in the film with the historical footage. 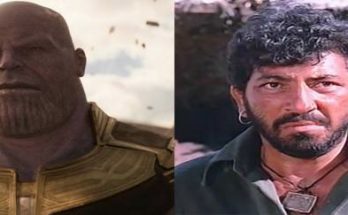 VFX team emphasised on practical effects more than the digital glamour. 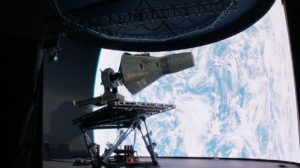 There were 619 digital effects shots in the film First Man. Costume designer Mary Zophres collected period re-creations of NASA flight suits from Chris Gilman’s Global Effects and Nathan Crowley the production designer recreated cockpits and space capsules. Miniature model of Gemini 8 capsule and X-15 cockpit was crafted by the artists. Full-size cockpit was used for foreground, miniature for mid-ground and CG for background. In X-15 shot where Neil sees the horizon for the first time; the reflection on his visor is the actual reflection from the LED screen. A spacecraft model was mounted on a supporting device and synchronised to move in sync with the footage on the screen; astronauts’ surroundings were captured by the camera in real time. The spin sequence for Gemini was created by rotating the content on the video wall rather than rotating the actors and actors also gone through skin tones during this shot. Camera captured the extreme close-ups of the astronauts and the interiors of the aircraft and spacecraft they were piloting. Double Negative restored archival footage one by one with VFX enhanced version. 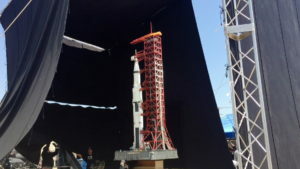 Ian Hunter’s team from art department prepared the Saturn V rocket from PVC piping, acrylic tubing and forty foot high. The miniature were captured during shooting stage in Atlanta by DNEG. Visual effects helped to re-create the scenes digitally and then camera and crew were removed. To give the feeling of 1/6th gravity DNEG added Computer Generated dust into the footsteps. Stunt coordinator James M. Churchman attached the astronauts to a bungee system calibrator to show anti-gravity which was later removed in post production stage. The music for the film was composed by Justin Hurwitz and performed by 94 piece orchestra. 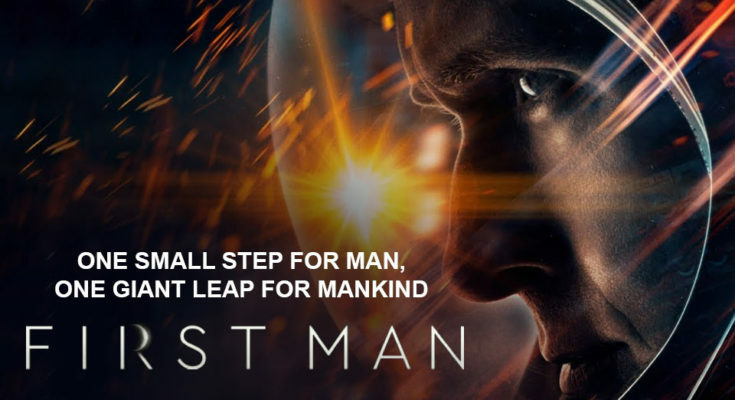 First Man was premiered at the Venice Film Festival on August 2018 and theatrically released on October 2018. 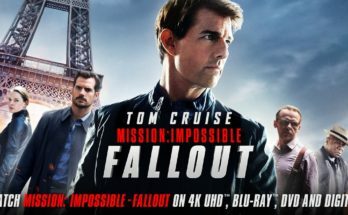 This film has grossed over $100 million worldwide against $59 million production budget and got 91st Academy award nominations for Best Sound Mixing, Best Sound Editing, Best Production Design and Best Visual Effects. Therefore it is evident that a lot of research, craftsmanship and innovation were put in the making of the movie First Man. Be a part of our MAAC Kolkata and explore the world of cinematic and Visual Effects.